Gretel’s past was a little fuzzy when we adopted her. We were told that the people who bought her got way more than they expected and couldn’t handle her. The issues of anxiety and aggression towards men were mentioned. The couple decided to surrender her to Motley Zoo Animal Rescue saying that the situation they took her from was “sketchy” and they didn’t want to take her back there. When we adopted her she came with various vet papers. We were told she was 11 months but one of the papers said she was only 8 months and, with the amount of time the previous owners and the rescue had her, that didn’t add up. Those paper also said she had already had her shots and been spayed. That set of papers was labeled “possibly fake” when we got them. We got a second set of papers documenting another vaccination and spay so we didn’t pay much attention to that first set. Little did we know, Gretel’s past was shadier than we had even imagined. I received an email titled “Gretel’s Past” from Motley Zoo the other day with a link to an article. Apparently, the lady that the original owners had bought Gretel from got busted for falsifying papers and trafficking, or “flipping”, dogs. An inkling by one of the buyers had led the local news to investigate the issue. It turns out that this woman had sold 21 dogs, of varying breeds, with phony paperwork that claimed the animals were examined at a local veterinary clinic but they weren’t. Gretel’s “falsified” papers claimed that she had all her shots and was spayed – none of which was true! Several dogs that were bought with this woman turned out to have medical problems. Everyone was mislead. The woman selling these dogs had been operating under a fake name but a slip-up led the local news to the real woman. Apparently, at one point, the woman had taken in too many dogs for her small apartment and sold one. That was the day she realized that flipping dogs could bring her some serious cash. It was revealed that this woman swapped dogs for cash in a grimy Seattle alley for cash. The woman claimed that no dogs were stolen but admitted she bought all the dogs cheap online and groomed them for sale. The woman first denied the allegations of forging documents but then admitted she did recognize them. She said she made them up because most people wouldn’t buy unless she provided a vaccination record. She said in order to sell the dogs she “would often bend the truth”. It makes me wonder what kind of person would sell a woman their dog without even checking the home or finding out what its living situations were. It makes me wonder who raised Gretel from a puppy and what kind of living conditions she was brought up in. Was she brought up in a puppy mill? Was she sold on Craigslist by people who were relocating and trying to find a home for their puppy? A woman and a man meet in a dark, dank alley. The alley smells like trash and steam from the sewers below is rising from the manholes. Hookers are loitering and drug addicts are slumped in the corner as headlight scream past the alley opening. The man pulls a scared, shaking, dirty puppy from a cardboard box and shoves it into the woman’s arms. He sneers as he snatches the money from her and turns and runs away into the night. Then the lady takes her home. Spiffs her up, falsifies the papers and sells her to an unwitting couple. No wonder Gretel was anxious when they bought her. Poor little girl. The woman who sold these dogs said “I want to apologize to anyone who feels like they were lied to.” And that she plans to call and apologize to the dog owners, and even help pay for vet bills if necessary. Too late lady, you slimeball! WHO does something like that? The article said that “her apologetic words are not good enough for the 21 dog owners and the Winslow Animal Clinic” and that the Police Department is now investigating this case. It Gets Deeper. Read more on this story. Gretel is so lucky to have found a home with you, Shawn, and Chester! What a terrible story. Thanks. The story is quickly unfolding, or rather the effect of this scandal is becoming more and more exposed. I am going to post updates as they occur instead of posting daily on this. I am just glad she was caught so this can stop. oh, Sweet Gretel! <3 she is with you now, and that is a good thing! I will never understand HOW people can treat any animal in a bad way. Our sweet dachshund, Basil, is a rescue, he has been with us now for 3 years (he is 8). He has enough quirks and weird actions (still, although less…) to lead me to believe his life before us was not happy. It breaks my heart to think about it, as he is The Sweetest Dog ever! I have grown up with dachshunds and they have awesome personalities, but Basil pup is the sweetest one yet. I feel the same way about Gretel. Although she has made great improvements and I suspect she will continue to do so, I know that this early trauma is something that she will never completely get over. Her first tendency will always be to feel anxious in unknown situations. I wish it wasn’t so but that is reality and we love her no less for it. and he shows improvement all the time too! it sometimes comes and goes, his quirky behavior. they add so much to our lives! I’ll be interested to hear more of this story as it unfolds – glad she is exposed. Gretel is very lucky to have found you. She may have had a tough start, but she is in a good place now. I look forward to hearing the updates. However I fault those puppy buyers as much as that seller. When you buy a puppy it is the buyer’s responsibility to check out where that dog came from, including the health of the parents and where that puppy was raised. With the internet, it isn’t as difficult as it used to be. Without an easy market, this stuff would not be profitable for the seller. I agree but apparently this lady had a really good story for everything. She told one couple that the dog she was selling came from her parents who were breeders in a rural area of the State. She said in this economy her parents couldn’t get the dog sold so she was selling it for them in the Seattle market. Apparently the buyers asked to see pictures of the parents. The woman said she would send them but never did. But, to your point, I suppose they could have asked for the breeder name and done some research online themselves. Well, Gretel is in a goooood home NOW. I see these dog flippers on Craigslist all the time. People asking for free pets so they can sell them for quick cash. You get to recognize the names and contact info. Or people who have placed their pet in what they thought was a good home, only to see it for sale on Craigslist the next day with a made up story about it’s history. One guy used to brag on Craigslist that he was a flipper (he hid his identity) and he got animals by going out every day and stealing them from people’s yards and cars. That was how he ‘made a living’. I want to pull my hair out over the sickening things I see being done to animals on there. I guess I knew somewhere in the back of my mind that this kind of thing was going on but I like to believe that the world is good so honestly I think I just block those ideas out and choose to live in ignorance. Never thought my life would be touched by something like this. scary! i believe this crap is happening all the time. i rescued 2 dogs from a “hoarder”. fortunately, they were not traumatized, but not socialized, either. i didn’t find this out until she got busted. in atlanta, there is a HUGE theft ring that steals purebreds right out of their yards. animal traffickers should be in jail! glad you’ve got Gretel now! I was worried about theft with gretel first because she was so young, a purebred and beautiful but as things unfold it is sounding more promising that was not the case. I’m so glad that you found Gretel. She is obviously in a very loving and nurturing home and she is one lucky little girl! Well, thanks for the compliment but I don’t think what we have done for her is anything special. However, I am sure she has finally landed in her forever home so that means no more councing around from scary situation to scary situation for her. That is about the best thing that could have happened for her. I am so glad that, though everyone’s responsible actions (after the shady lady), Gretel has been given a good doggy life and there is a happy ending to her story. Wow – that is crazy! I’ve never heard of anything like this. I really do wonder about humanity sometimes. The people who will do things like this just amaze me, really. I’m happy that little Gretel has a wonderful home with you now! I hope the other pups affected by this situation found safe homes as well. Gretel is a lucky little dog to have been rescued by you and to now have a loving, caring home after all she has been through. How can that woman sleep at night after what she has done? I’m surprised to hear that about Gretel because when she stayed with me I didn’t notice any anxiety at all. She ws so much fun to have around. I had the same issue with Sienna. I adopted her from the Seattle purebred rescue org and she had been with a great foster mom for 4 months. They said originally she was brought into the Tacoma shelter pregnant and had one puppy. It is obvious she was used as a breeder. but then why would someone drop her off pregnant. It didn’t make sense. So I wonder if she got loose and someone picked her up and brought her in. I tried to find out more info from the shelter but matched up so I am no closer to knowing what actually happened today than I was a year ago. Unfortunately people are doing whatever they have to do to survive these days and if someone is not an animal lover then its easy to see dogs as a commodity to make money off of. It disgusts me as well. Whenever I see someone advertising a dop for adoption on CraigsList for more than a $50 re-homing fee it makes me suspect. But fortunately the CraigsList community is pretty good about policing the list. I just don’t get how people can think it’s ok to behave like this?! I’m so glad Gretel got lucky and found a great forever home and I’m really happy the lady got caught! A friend of mine went through a similar situation a few years ago, and with a doxie as well! They finally agreed to buy their daughter a dog, and found this woman online somehow… she seemed to check out, and they spent about 1500 on the dog (no idea if that’s the going rate for doxie puppies? ), and he died within about 6 months of an untreatable liver illness… They spent about 2000 trying to find a cure, but the vet couldn’t figure out what it was that was wrong with the poor dog. Turns out that three other pups from that same litter had died before reaching a full year of age… same issue with previous litters. She was breeding her dog despite knowing that the dog was passing on something, some kind of disease or genetic issue, that was making these puppies too unhealthy to survive for long. And she was selling them with a clean bill of health. They and some of the other buyers threatened to sue her, managed to get their money back, and reported her to the authorities, but htis had been going on for years. That’s awful….and in my experience, unless you are getting a Dachshund from a champion breeder and using for show $1500 is way to high to pay. 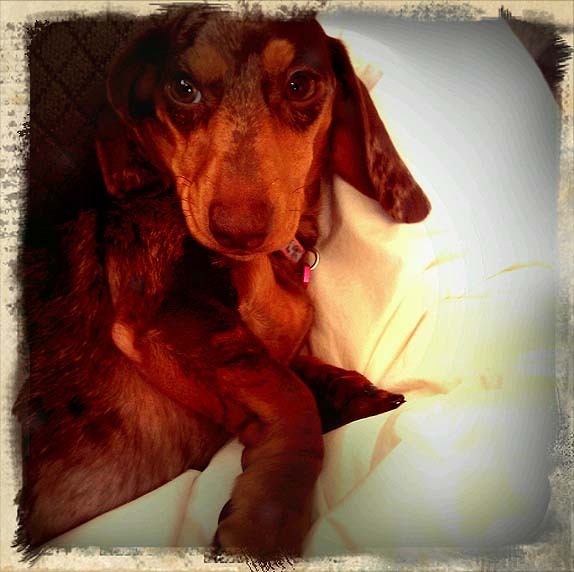 Pet quality Dachshunds go for $600 to $800 around the Seattle area. Since we are a metro area I would expect the price to be lower in rural areas. Flipping dogs sounds kinda fun, but mom says you’re not talking about that kind of flipping. I’m SO glad Gretel found you. What a bad person to be using doggies to make a profit. Yeah…not ILLEGAL but definitely immoral. I don’t know what Gretel’s life was like before she found me. I hope it wasn’t too bad but I do hope she knows she has it better here. Ha, ha. What? This is just totally bizzar sounding! And you are just now finding out all of this information-weird! Oh, no….I knew this in the beginning. I just reshared this old post because I have seen a lot of people talking about dog flipping lately. I never even knew it was a thing until I adopted Gretel.